The Battle of Britain was a decisive turning point in WW2, a seminal moment in the survival of a nation and immortalised in Churchill’s speech in recognition of the ‘Few’. Today, it is symbolic of the central UK air power doctrine belief that Control of the Air is the primus inter pares role of air power, and for much of my career it is a belief that I have faithfully adhered to. Now, however, not only do I not hold such a belief, I am no longer certain that Control of the Air is an air power role at all! I can hear the howls of blasphemy from practitioners and theorists alike, but please let me explain before condemning the audacity of my proclamation. Far from seeking to undermine its pre-eminence, instead I will argue that Control of the Air is the very essence of air power itself and should be elevated above its constituent roles. The 4 UK air power roles of Control of the Air, ISR, Attack and Air Mobility were quickly established in the pioneering days of military aviation and have stood the test of time to the present day. The exact names and definitions have changed over the years, but their purpose and significance to all military operations in the physical domains has endured. However, whilst ISR, Attack and Air Mobility are activities, Control of the Air is a relative condition and effect in its own right which sits uneasily with its siblings. Not only that, each of the other 3 air power roles contribute to Control of the Air. Inevitably this draws the casual observer into equating Control of the Air with combat air capabilities fighting for it. This is unhelpful. Air Mobility assets contribute to Control of the Air through self defence systems and flares if fitted, or through air to air refuelling to extend the time and/or expand the space that combat air assets can fight for Control of the Air. Similarly, ISR assets conducting surveillance and battlespace management at range are an essential element of the Control of the Air force mix. Attack capabilities exploit height, speed and agility to gain sufficient Control of the Air to prosecute ground targets in a contested environment, whilst 5thgeneration capabilities aim to exploit low observable technologies to gain Control of the Air to reach their targets undetected. Early air power theorists Douhet and Mitchell firmly believed in achieving ‘Command of the Air’1. Attack and the RAF Home Defence Force of the 1920s was an attacking force at heart against a perceived threat from the French. It wasn’t until the 1930s when Germany re-emerged as the principle threat that defensive measures came to the fore in UK air power thinking and capability development in the form of the iconic Hurricane and Spitfire. However, both the Hurricane and Spitfire were the tip of the spear in terms of Control of the Air. Chain Home ground based radar, Royal Observer Corps reporting stations, and integrated command and control from the 11 Group Bunker at Uxbridge were all of equal significance in the success of the Battle of Britain. 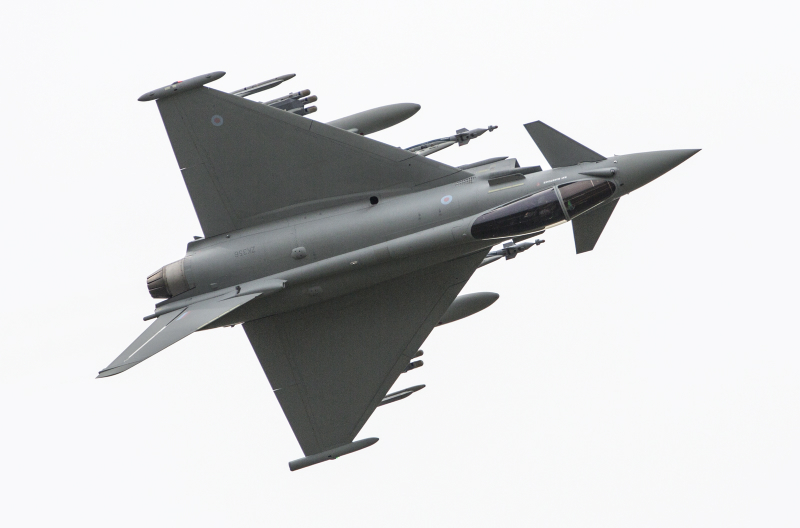 Current UK air power doctrine does not give a precise definition of Control of the Air but describes it as ‘a relative condition [which] depends on available resources and the risk that a commander is prepared to accept’2 and defines Air Superiority and Air Supremacy as 2 relative conditions of air dominance over an adversary. It then goes on to describe 2 mission types: Defensive Counter Air (DCA) and Offensive Counter Air (OCA). OCA is needlessly disaggregated from the attack role. The desired effect may be different, but conceptually the activity of prosecuting a target on the ground from the air remains fundamentally the same. The definition for DCA is comprehensive and goes on to describe how surface to air missiles and passive measures such as camouflage and concealment contribute to this mission type. This is a curious mix for an air power mission type. These elements absolutely contribute to Control of the Air along with a vast array of other military activity in all 5 domains, but they do not exploit the attributes of air power, so cannot be an air power mission. It is the sheer breadth and depth of active and passive measures that contribute to Control of the Air, the majority of which do not exploit air power attributes, which make it uneasy company as an air power role. So, if Control of the Air is not an air power role, what should fill the void? It is very clear that air power has an important part to play in countering threats in and from the air domain. The term air defence is used 10 times in UK air power doctrine, though no doctrinal definition is offered. All 10 uses of the phrase refer to enemy air defence capabilities, ground based air defence (GBAD) or air defence radars. Yet curiously there is no mention of air power’s role in air defence! Air power has a unique and important part to play in air defence at home and overseas; however, it is obscured by the mantra of Control of the Air as an air power role. Air power’s height speed, reach and ubiquity allow a response to air threats at range over a wide area, potentially beyond the reach of an adversary’s weapon system. Air power also allows a graduated response to air threats, by intercepting and engaging an adversary or non-compliant aircraft in a non-lethal manner that can escalate or de-escalate as required; thereby providing a scalable deterrent effect that cannot be achieved with GBAD. Air defence as an air power role would allow a better conceptual understanding of how air power’s attributes can be exploited through capability development; usefully recognise the effects that can be achieved other than Control of Air; whilst disaggregating air power from ground based activities and passive measures. Furthermore, current UK air power doctrine fails to articulate the unique selling point of air power in the context of joint action. Whilst the 4 elements of joint action of fires, manoeuvre, information activities and outreach3 do not precisely correlate with the 4 air power roles, they should contribute to them. Attack – fires and manoeuvre; Air Mobility – manoeuvre; and ISR – information activates. Yet Control of the Air, rather than contribute to joint action, is a product of all 4 elements including outreach through Defence Engagement and access, basing and overflight permissions. Fundamentally, air power in all its form contributes to Control of the Air through height, speed and agility and achieves its reach and ubiquity from it. It is the very essence of air power. Hence the audacity of my proclamation – Control of the Air is not an air power role! Wg Cdr Hannah Whitehill has spent the majority of her career flying VC10s on air-to-air refuelling and air transport missions. She has also been a futures and concepts writer with DCDC contributing to Future Operating Environment 2035 and Future Force Concept. She is currently a course Director with the RAF Division within JSCSC. Giulio Douhet and Dino Ferrari, The Command of the Air(Washington DC: Air Force History and Museums Program, 1998). DCDC,Joint Doctrine Publication 0-30: UK Air and Space Power2ndEd(MoD, 2017), 27. DCDC, Joint Doctrine Publication 0-01: UK Defence Doctrine (MoD, 2014), 43.